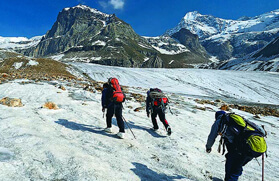 The Khatling glacier, the extremely beautiful glacier, is the source of the river Bhilangana. A legend behind Bhilangana origin says that Bhilangana, a divine spirit tried to tempt Lord Shiva. She was rejected by him and distorted into a liquid form and thus, originated the river Bhilangana. Sahasratal and Masartal are on the west and east of Khatling glacier. This glacier is enclosed by snow capped peaks of the Jogin group (6466 m), Barte Kauter (6579 m), Sphetic Pristwar (6905 m), Kirti Stambh (6902 m) and Meru. The Valley of Bhilangana is certainly the best place to visit for nature and photography lovers. If you have a passion to explore the real beauty on this earth, then trekking to Khatling Sahastra Tal can best meet your needs. You will cross many lakes like Masar Tal, Vasuki Tal and Sahastra Tal. You will get a panoramic sight of hanging glaciers and majestic snow-covered mountains on the Khatling Sahastra Tal trek. 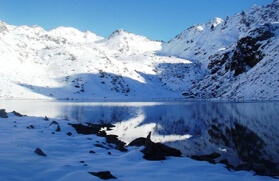 In the beginning of this trek, you will traverse through lush green fields and thick forests and later, you will cross through two passes above 17,000 ft that are negotiates glaciers moraines and a snow patch. In the monsoon season the meadows on this trek is on full bloom with a numerous color of wild flowers. 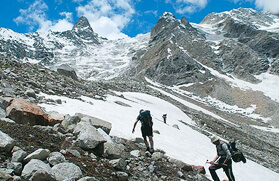 At Trekking in India, we offer a well-planned Khatling Sahastra Tal trekking tour to make your adventure holiday more enjoyable and interesting. 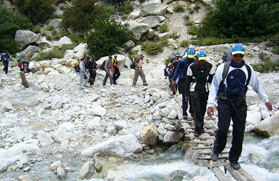 This trek will begin from Bhilangana Valley and ends at Kedarnath Valley. Further, this trek is rated from moderate to challenging. The best time to plan a travel on this trail is between May to Oct. 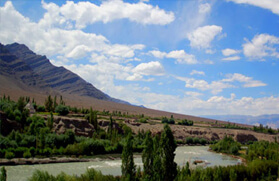 The entry to the Bhilangna valley provides excellent spots for camping. 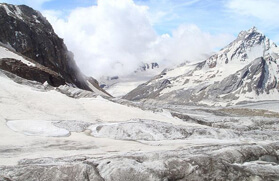 The Khatling glacier is a lateral glacier, at the source of the river Bhilangana. Sahastra Tal and Masartal are on the west and east of it respectively. 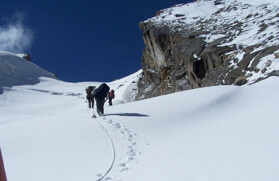 The Valley of Bhilangana affords a panoramic view of snow capped peaks and hanging glaciers. Jogin group, Kirtistambha and Meru are sublime and magnificent. 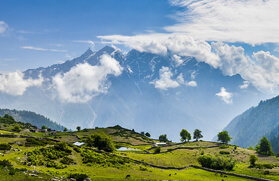 The entire trek passes through thick forests and beautiful lush green meadows in the beginning. 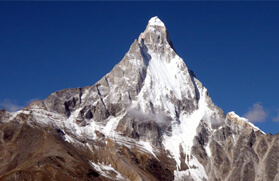 Later, it crosses two passes above 17,000 ft. and negotiates glaciers moraines and a snow patch. Morning after breakfast proceed for Uttarkashi (1150 mts), which takes 5-6 hrs. Upon arrival check-in at Shikhar Nature Resort. After lunch visit NIM (Nehru Institute of Mountaineering) Institute & Museum. In the morning after breakfast drive 25 kms to Malla and from here 9 kms trek to Sillachhan with packed lunch. Dinner and overnight stay in tents. In the morning after breakfast trek to Kushkalyani with packed lunch. Dinner and overnight in camp. Morning after breakfast trek to Kyarki Khal via lush green meadows, waterfalls and much more. Dinner and overnight stay in tents. In the morning we will trek to Parital via a Kyarki Bugyal. Dinner and overnight in Camp. In the morning after breakfast trek to Sahastra Tal via Taddiudyar with packed lunch. Dinner and overnight in camp. In the morning trek to Kalyani with packed lunch. Dinner and overnight in camp. In the morning trek to Kharsoli via Biroda with pack lunch. Dinner and overnight stay in tents.Day 11: Kharsoli - Tambakund (3413 mts/11195 mts) 8 kms/5 hrs. In the morning trek to Tambakund with pack lunch. Dinner and overnight in camp. 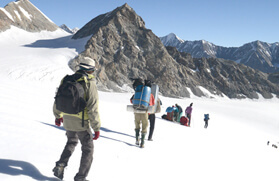 In the morning trek 3 kms trek to Khatling Glacier with packed lunch. In the afternoon, return trek to Tambakund. Dinner and overnight in camp. In the morning trek to Masar Tal with packed lunch. It's a High Altitude lake. The place is rich in fauna. Here is a small camping place. Dinner and overnight in camp. In the morning trek to Vasuki Tal via Mayali pass (5400 mts) Painya Tal and Teental with packed lunch. 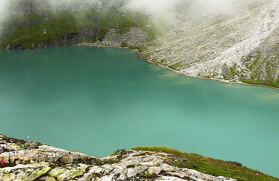 This is a crystal clear pearl set in an unrivalled setting the Vasuki Tal Lake. From here the Vasuki Ganga starts which mingles with the Mandakini at Sonprayag. Dinner and overnight at Vasuki Tal in camp. In the morning trek down to Kedarnath with packed lunch. The temple is magnificent in its style and architecture and to construct such a temple at this height over one thousand years ago must have been quite a feat. It is the abode of Lord Shiva and one of the famous Jyotirlinga. Dinner and overnight stay in TRH/ guest house. After breakfast trek down to Gaurikund with packed lunch. As per religious texts Goddess Parvati meditated here for a considerable time to win a consort in Lord Shiva, Gauri is another name of Parvati. Also a famous temple of Gauri is at Gaurikund. Further drive to Rudraprayag. Dinner and overnight stay in hotel/TRH. In the morning take a holy dip in the confluence (Mandakini & Alaknanda River). After breakfast drive to Haridwar. On arrival check in to hotel. Dinner and overnight stay at hotel. In the morning after breakfast drive to Delhi. Lunch enroute. On arrival at Delhi transfer to airport to catch your onwards flight.